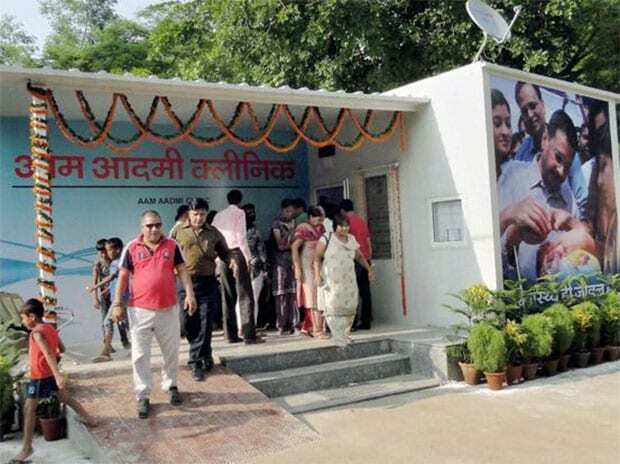 The Aam Aadmi Party's Mohalla Clinic initiative drew huge praise Friday from former secretary-general of the United Nations Ban Ki-moon and former Norwegian prime minister Gro Harlem Brundtland during their visit to a health facility built under the project here. Ban and Brundtland visited Peeragarhi Mohalla Clinic and a polyclinic in west Delhi's Paschim Vihar along with Delhi Chief Minister Arvind Kejriwal and Health Minister Satyendra Jain. Ban said he was deeply "touched and impressed" with Kejriwal's "strong engagement and vision" to provide primary health care service to poor and vulnerable people. "Mohalla Clinic and polyclinic are good examples of it. I hope there will be much more support and strong engagement at the Union government level also," he said. The former secretary-general suggested India to increase its budgetary support to to health services from one per cent of the GDP to 2.5 per cent by 2021. Kejriwal told Ban and Brundtland about "several political obstructions and interventions" created in setting up Mohalla Clinics, without naming the Centre. "In the last two-and-a-half-year, we could not do any work due to several obstructions but after the Supreme Court judgement we are confident to set up a thousand Mohalla Clinics in next few months," he told reporters here. Ban and Brundtland are in the country as part of a delegation from The Elders, a London-based organisation of independent global leaders who pool their collective experiences and resources for promoting peace, justice and human rights. Brundtland, who has also served as the director general of the World Health Organisation, said she witnessed "impressive work" being done at the Mohalla Clinic and the polyclinic. "In Delhi, with Mohalla Clinics and plans to develop them, you are approaching what needs to be done for all people, for every Indian and everyone in every country. So, we are happy to see what is being done here in Delhi and what the government has been planning and implementing on the behalf of the people of this region. It needs to be done all over India," she said. She cited "much more attention" on public health services and enhanced spending on these services by south asian countries and China, expecting India to follow suit. The Mohalla Clinic at Peeragarhi, the first of the series, was inaugurated on July 19, 2015. At present, 189 Mohalla Clinics are operational in the city.